JR East started a new stamp rally. 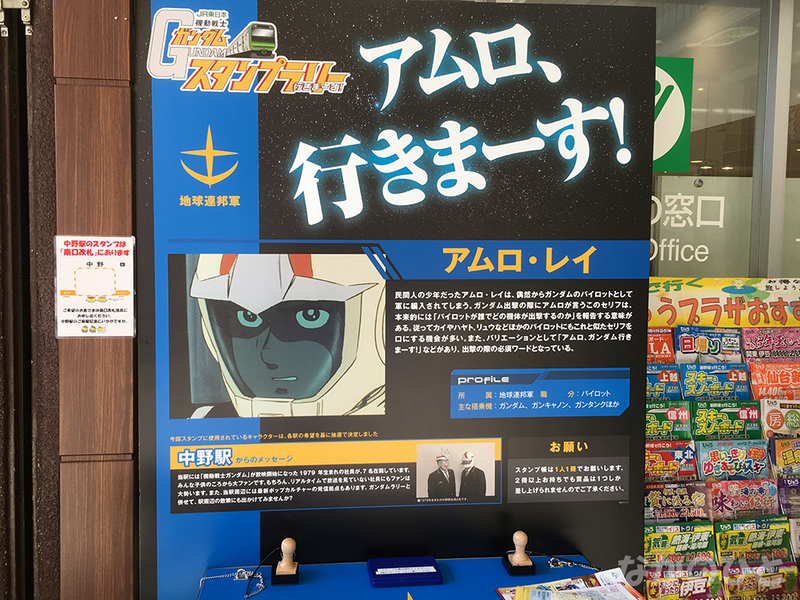 This time, it is Mobile Suit Gundam Stamp Rally. To the logo is added the word "Iki masu" which is a famous speech seriously. Like other stamp rallies so far, the stamp was set up in the south entrance. And the character of Nakano is the hero Amuro Rei. It seems that the character of the station was decided by lottery based on the hope of each role, but the hero is like Nakano. And the message from the station is also interesting. The station attendant was talking stupid impressions. This page contains a single entry by shannon published on January 9, 2018 10:46 PM. Extraordinary Hello! Shop to Nakano Broadway was the previous entry in this blog. The heavy snow, Nakano of January 22 is the next entry in this blog.